Could Milk Be Your Secret Muscle Building Weapon? As science catches up with athletic medicine, it certainly is within the role of the certified athletic trainer to have opinions on the fuel used by athletes to replenish and recharge after exercise. Look around you, check the internet, have conversations with colleagues and attend meetings to find out more about this area. While it is undoubtedly within the domain of sports nutritionists and dieticians, most high schools and many colleges are not fortunate enough to this caliper of professional on staff. 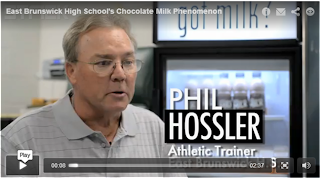 Cost, convenience, availability and taste are all factors to consider when urging your athletes to utilize something during that two hour post-exercise window to recharge energy stores and replenish depleted protein sources. Protein.Helps build muscle, reduce muscle breakdown and works with carbohydrates to restore muscle glycogen. Carbohydrates.Refuels muscles (restore muscle glycogen). Electrolytes.Helps replenish what’s lost in sweat (sodium, calcium, potassium and magnesium). Calcium and vitamin D.Strengthens bones and reduces the risk of stress fractures. B vitamins.Helps convert food to energy. 9 essential nutrients.Offers additional nutrients not typically found in traditional sports drinks. Adding milk vending machines or selling milk at games for fund-raisers are ways to incorporate milk onto your team. For more information on milk, go to the below links. Or, sign up for our enewsletter to keep current on the latest sports medicine trends.